Some Days Are Diamonds: She just gets it . . .
Several months back, a fabulous woman I met through work, who I am honored to now call a dear friend, called me while I happened to be browsing my favorite antique store. "I need stuff". She laughed. "What kind of stuff?" 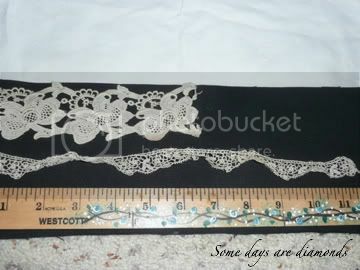 "Lace, ribbons, flowers, vintagey, paper ephemera . . . stuff" . . . thinking she would NEVER understand. "Karen I have just the box for you. I'm going to ship it to you." My first thought was "OH GEEZ! How much?" Because Claudia is a highly educated and trained professional art appraiser. She also does Estate Sales. But she is BIG TIME . . . . if you know what I mean. Nothing little ol' me could ever afford. "uhhhhhh . . . Claudia - what do you think you would charge?" "Oh Karen, I just know you are going to love each and every thing in this box, it's been in my garage for about 40 years now. But if you don't like it, send it back and it'll be no problem." Okkaaaaayyyyyyyyy . . . UGH! I got it two days later. I was so excited but kind of nervous - some people just don't get this whole vintage craft thing. I opened it up not having a clue what I was going to find. Here is just some of it . . . It all came wrapped in an old sheet zipper bag. 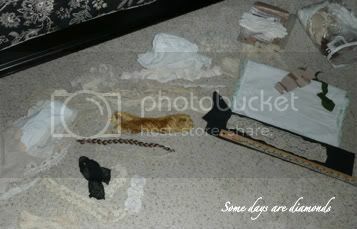 Once I started pulling things out . . . I got REALLY excited! And it just kept coming and coming . . . 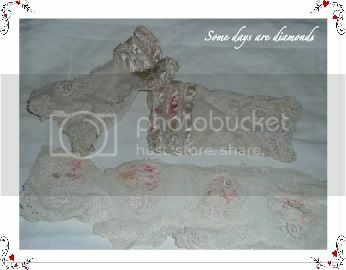 Hundreds of old, beautiful, YUMMY pieces of lace and ribbon and cloth. different fabrics so I could see it against the carpet. 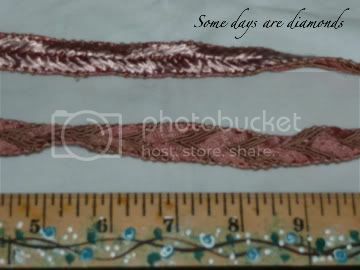 Beautiful old trims in lovely shades of pink . 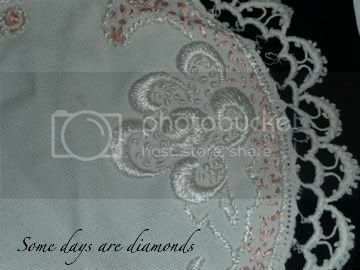 . .
from an old gown. STUNNING! Old collars - several of them . . . 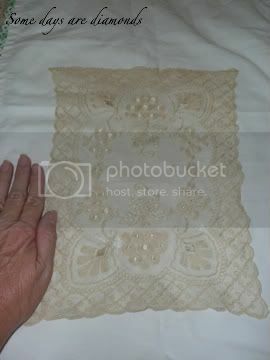 Doilies and handkerchiefs . 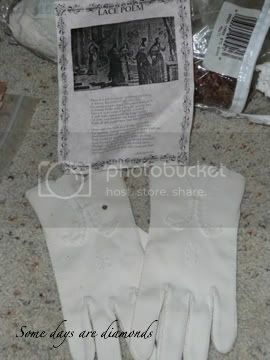 . .
Old well worn gloves with a poem tucked inside . . . I wonder what the story behind that is? 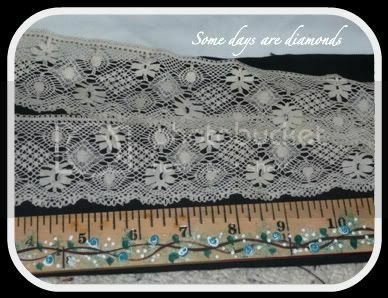 We are talking YUMMY pieces of lace and trims. 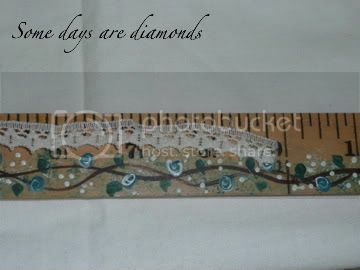 Some pieces just very small, one was only 3" long. But I love it! All of it! it feels like it is just going to melt when you pick it up. (like I have a tendency to do. on a very special project I'm making right now. Recipient shall remain nameless . . . but! She just "gets it". It turns out she had backpacked all through New England before attending college and kept finding all of these wonderful things. She stuffed them in her backpack and figured some day to use them. She never did, but held onto them until she could find the right person to pass them on to. And that! my dear friends! was LUCKY ME! Sigh. Just good stuff. Well, that's it for today. I have so much to do! All my swaps are finished, with the last one ready to be mailed on the 15th. 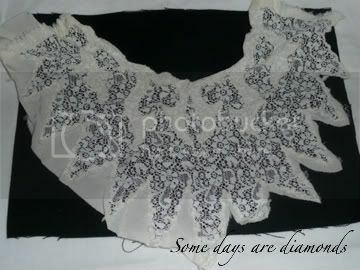 I just have a few more things to get together before I take off for Petticoats and Parasols in Savannah on the 21st. OMG! It's almost here! I RSVP'd for this Art Event last September when I met Jennifer Hayslip at An Artistic Affaire L'Autumne. And when I asked Jodie from Everything Vintage if she wanted to come - it took her all of about three seconds to say yes. I cannot wait!! We are going to have a wonderful, wonderful time! Off to the market . . . Have a wonderful day everyone! OH MY GOODNESS... you are the luckiest human I know! I love all of these beautiful treasures:) Hugs to you and thanks to the giver of sweet gifts to you that you so deserve. Have a sweet day my friend. Savannah is a beautiful place and one of my favorites:) HUGS! Oh gosh I6t took my breathe away!!!! You are going to be in Craft heaven with all of that!!!!! it is such a lovely place to visit!!! !I loved it!!!! Have fun and keep breathing and loving all those things!!!! I could see a few of those hanging on a wall!!! !In a cute oval frame!!!!! how much fun is that...everything is gorgeous!!! I am soooo jealous, shame on me, but you are going to have sooooooo much fun, take thousands of pictures!!! Wow, what a treasure! Have fun in Savannah...have you been before? Its a fantastic place! Oh YES, she gets it alright!! It took my breath away too! What amazing and incredible treasures your awesome friend gave you!!! You are indeed so very lucky! 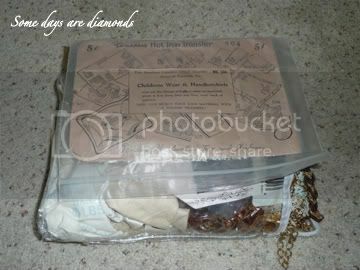 Looks like this box of treasures found its way to the right hands, life is amazing! Hey girl, wow, you hit the jackpot! These are such wonderful goodies! You know what to do now. Just pack everything back into the box and ship it to me! Lol, just kidding! Enjoy your fantastic treasures and have fun playing with them or hoarding! Have a great day, dear Karen! Wow! 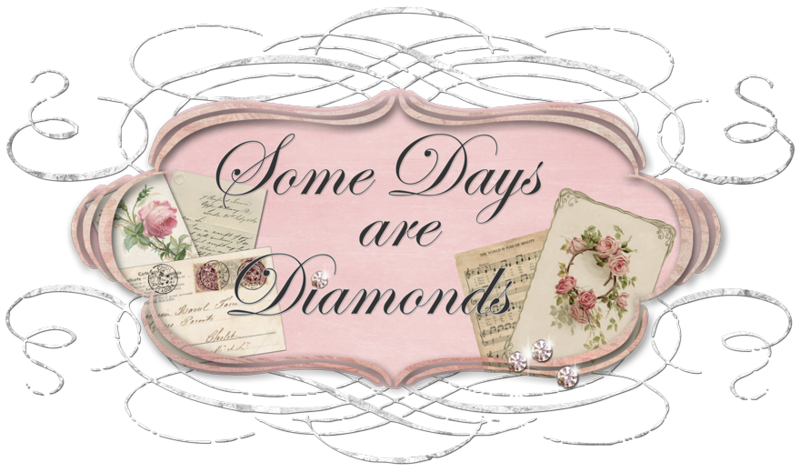 I would say that your friend provided you with a definite diamond day (or more likely, many of them)! And your sharing with us (virtually) spread the wealth! Hi Karen, gracious girl.....these are so lovely. You are one blessed gal. 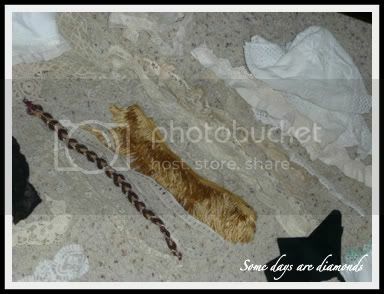 I love your stash of beautiful laces and trims. Those collars are wonderful and gloves too! Woohoo! Have a great trip, hope you find lots of good stuff. Wheeeee! What a wonderful gift!! I'd say your friend definitely 'gets it'. You're going to have alot of fun with all those beauties. Oooh, looks like lots of crafting goodies to keep you busy...like you aren't already!! Enjoy them my friend. Karen where do you think I could find a friend like this??? You are sooo lucky! Such gorgeous stuff. I'm wondering how Claudia could part with it all. Little Miss Taylor is one darling baby. Isn't it just the greatest thing to welcome a new baby to the family? So glad that you were all safe during the quake.We had a quake here in Idaho years ago and I still remember how scary it was. My girlfriend called me up and ask if I would bring my kids over and so we could be together for the aftershocks. Our husbands weren't around and we were chickens to be alone. lol I'm a little braver now, but I don't think I'm earthquake brave yet. WOW...I'm jealous!!! ;o) Have fun in Georgia! How fun. I've found myself saving little bits and pieces of things after seeing all the wonderful things you do with them. Loved all the baby photos. What joy! I hadn't heard the earthquake lasted that long. Wow! I remember when the SF one hit I was looking out our window in our old home and it looked like the glass looked like a wave. I couldn't believe it didn't break. Glad everyone was safe. Wow, what a boatload of New England treasures. That's where I'm from. Massachusetts. And.... I will be meeting you in two short weeks at Jenn's P&P event. Wahooooooooo..
Look at all that gorgeous stuff--lucky you!!! What a sweet friend you have! 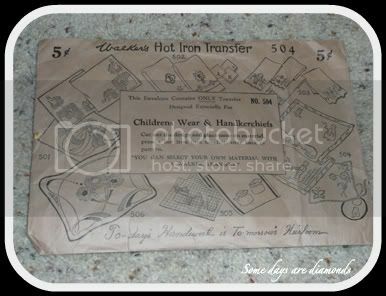 Thanks so much for your kind visit yesterday--you asked about the stacked appliance in the picture with my mom--I think it was just a double oven--that's what she remembers, anyway! What a fun story. Have fun with all the goodies!